Uganda has a population of 32 million people. Given that there are a only a handful of dermatologists to serve Uganda's population, I was unsure of what to expect. Patients came in from across the country with health concerns they had for years without any diagnosis, all of them having failed multiple treatments prior to coming in to see us. One of the most memorable was a little boy with that was brought in by his mother with a face that was 'being eaten up.' It started with a little sore on his nose and despite seeing numerous doctors for years the sore grew till his entire nose, mouth and cheeks were crusted over and he started having trouble breathing. He was admitted to the hospital and thought to have a deadly kind of cancer. As he walked into our clinic, one look at his little face told us that he had a very curable disease. Cutaneous tuberculosis is rare, and I had only seen it in text books. But this little boy, almost for certain, had a disease that could be cured with several months of antibiotics. A curable disease, easy and free to treat, yet this boy had progressed to the point of his nasal cartilage being destroyed. Another young man came in, face disfigured with tumors and nodules, hands swollen with open wounds. He had lived the past few years hiding behind a wide hat while hoping that the numerous antibiotics, antifungals etc would allow him once again show his face to the world. 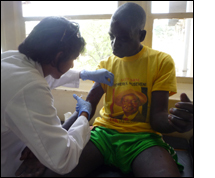 He walked into the clinic room and took off his hat, and a few minutes later he was diagnosed with leprosy. We enrolled him in the country's leprosy treatment program. I had not realized that dermatologist's services could be so useful in Uganda. It was incredible to use the training I have the fortune to have and work with those who have such scarce access to this specialty. I learned about things I had only read in text books, and got to help those who had passed through the health system, thus far unrecognized. It was amazing.